Hostels and hotels tend to be full even especially during the summer months from June to August. Unless you plan to sleep in the train station, it’s best to plan ahead if you are staying in a city overnight. I had to sleep at the station in Bordeaux. Since all my train plans were done last minute, plus the facts that I arrived late due to a train strike, it was summer and the first day of the Bordeaux Wine Festival (which I only found out when I arrived), by the time I made it to Bordeaux, all the affordable hotels were full. So after leaving my stuff in the locker, I went around and then spent the night at a bench in the train station. I booked one hostel via e-mail. I had booked for June but did not notice that in their reply, the booking was for May! It was a good thing I called the youth hostel before leaving since I wanted to ask for directions. When I gave the booking number, they said it was for May and I got charged already on my credit card since I was a no-show plus the bed I wanted was already fully-booked! Good thing the staff checked the e-mail trail and saw that I indeed had requested for a June booking and the mistake was on their side. So after making some calls to the manager and using another system to book me a bed, they were able to fix it and everything was fine and I didn’t have to pay anymore. This saved me a lot of money since I did not have to pay for accommodation. The down side is that it may mean not taking a shower! But if it's cold anyway, I don't think that would be much of a problem. Check out related post on Eurail travel tips. For those who really cant travel light, lockers are for you. You can leave your big luggage at the train station and bring a small backpack when going around. It conserves energy and you move faster and more comfortably. While major stations are sure to have lockers, not all stations have them. When we got stuck in Hendaye due to a train strike, I wanted to move around and explore its beach. But unfortunately, I couldn’t leave luggage at the station since there were no lockers. So I was stuck there since my luggage was quite big. You'd spend about €2,50 to €8 depending where you are and how much luggage you have. In Reims, I was expecting there were lockers. Unfortunately, there were none too. So I had to take a cab to the Notre Dame Cathedral with all my bags. Then took the bus. I don't think I have to elaborate on this. Because if you're not joining a tour group, big bags will be a big problem. Make sure you buy a backpack than can hold a lot of stuff. That will come in very handy. Investing in lightweight travel clothes will also be a good idea. And because you have to pack light, you may only be able to bring one pair of shoes. So make sure they're comfortable as well. I'm all praises for the very absorbent and lightweight Aquazorb towel I had with me. And it dries up really quick too. 7. Bring some food from home, but not too much! You can bring crackers, maybe some foil packed corned beef, pork and beans, peanuts, etc. I was able to save a lot of time (and money) since I ate on the go, and thus was able to visit more. Dish the cup noodles since it's bulky. And unless you’re staying at a hostel every now and then, finding hot water will be a problem. But note that you shouldn't rely to much on food from home. What is travel if you do not try the local food? There are so many cheap options in the supermarket. Unless you have a budget to spend for trying out the local food which could range from €7,00 to €15,00 per meal, remember to buy water and food at a supermarket. Near tourist attractions, a 500ml bottle of water can cost as much as €2,00. At the supermarket, a 1.5L bottle of water can cost as little as €0,17 to about €0,50 depending where you are. In France, I was shocked to see that the only available water at vendo machines and train stations was Evian, which could cost as much as €2,00 for a 500ml bottle! When I visited a local Carrefour to stock on supplies, the Carrefour Eau de Source was €0,17! Even Evian is cheaper at the supermarket since a 1.5L bottle can go for as low as €0,60. For a meal, I got cold cuts such as Danish salami for as little as €0,88 for a 200g vacuum-pack plus a pack of 10 croissants for €1,10. To complete the sandwich, I purchased a tube of mayonnaise with Dijon mustard at 1,75 (which lasted me several days). That was good enough for three persons and lasted me two meals and a snack. You can be creative and add more to your sandwich if your budget will allow it. If you’re too lazy to make your own sandwich, try to look around for a sandwich stand or the local Turkish doner store (which sells the doner kebabs or yufka doner). I got salami sandwiches with vegetables for as low as €1,70 at train stations in Germany. Doner kebabs are found all over Europe and can be as cheap as €3,50. While the breads with meat and chili can go as low as €1,20 depending on the country. In Germany, I got really great breads at €0,70 (a must-try in Germany) at stores in the tourist area. It’s amusing though that food was cheaper than water in Germany. It’s a good thing that water from the faucet is usually potable. In Amsterdam, hot dog stands sell cheaper sandwiches than the Doner stores. Medicines are not cheap in Europe. So stock up before you leave, especially the vitamins which you will need for the tiring trip. Always have medicines for cough and colds, fever, a bad stomach (constipation and diarrhea), motion sickness and allergies (if applicable to you). Although they say having allergy medicine on hand even if you don’t have any allergies may be a life saver if suddenly you or a companion discover you are allergic to something. It might be good also get some essential travel vaccines. 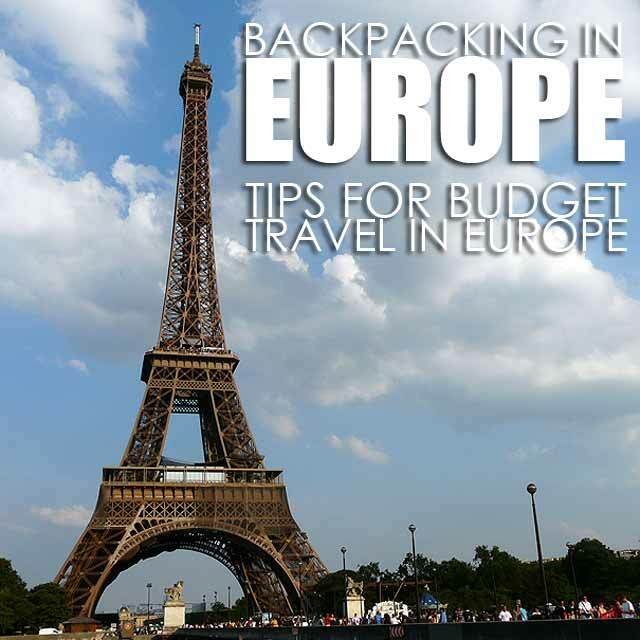 Since you’re traveling on a budget, the last thing you’d want is to lose stuff to pickpockets. So be wary of strangers approaching you on the street. Be careful when someone suddenly approaches you with “Speak English?” since they could be up to no good. In one square alone, I remember being approached three times by three different women with the same question. I always look puzzled and say “no” or just shake my head. Besides, there are tourist information offices in the area where they could ask all their questions. Remember that poverty is also existent even in Europe. And with the invisible borders, you also get undesirables migrating from the poorer regions of Europe to the better off ones. While it’s nice to be nice and polite, it’s the nice people that usually fall prey to these scams. I always tell myself that I won’t be able to answer anyone’s questions anyway being a stranger myself. So I just politely say “I don’t know” and continue walking. They work in teams and will try to grab your attention to distract you so that another companion can grab your stuff. At ATM machines, be wary of falling money since that’s another way to distract the unwary traveler. These snatchers will drop money and make it seem that the money that fell was yours. That’s to distract you so that they could grab the cash coming from the ATM machine. My personal exception for talking to strangers on the street is when someone asks me to take a photo since I do that too. But then again, it’s your choice. And you should know yourself well enough to differentiate the genuine queries from the scams. Just be alert and careful and mind your bags and pockets when interacting with strangers. Anyway, hope that helps you plan your trip. My next post will be about traveling on the Eurail. Which embassy would you recommend we get the Schengen visa from? And do you have any tips when applying for a visa if for example I'm straight out of college and don't have a job yet? Totally agree with supermarkets! I did the same in Australia, and I was lucky because they have a lot of good ready to eat stuff that's pretty cheap. Same with potable tap water. I would just refill my water bottle at the hostel before setting out. Another consideration is staying at hostels that have kitchens so you can cook your own meals. @annleemited, Schengen countries are very strict. You have to apply in the country where you're staying the longest or your main destination. I had to get my Schengen visa in Jakarta since there's no Portuguese Embassy in the Philippines. For as long as all your papers are in order (students or those without a job will still need proof of income, personal or of parents) you shouldn't have a problem. @Nina, the water bottles do come in handy. In South Korea last month, I survived on refilling water bottles at restaurants and hostels. Our itinerary would be London, UK (2 nights), Amsterdam, NL (1 night), Brugge, Belgium (1 night), Brussels, France (1 night). What visa should I obtain? UK Visa or Schengen or both? i'll be travelling in europe late this year and i have a few questions? 1. when you travel during the night. you really don't take a shower? can't you take one in the train? 2. is the locker in train station safe? 3. what train line did you board in? can i reserve train tickets through internet without going to the travel agency? 1. Unfortunately, no shower rooms at train stations I visited. On the train, maybe if you get the really pricey cabin. 2. They have computerized locks and are well-monitored inside the train stations. 3. You can purchase a Eurail Pass online but you'll have to give an address where to mail it to. So it's still safer to get it from a travel agency. hi ivan, thanks for the reply. 1. is it okay to sleep in the train platform? do they allow it? 2. does hostel/hotel in europe allow backpackers to use their showers? pay a minimal fee? 3. how big is the train locker? is bringing a luggage advisable? hi sir ivan, me and my husband love to travel...but backpacking budget only... our last travel was in korea..next year we plan to do a 1 month backpacking in europe, we want to cover most of the shengen countries....we love the idea on sleeping in trains etc, we are used to hostels for accommodations...we want to talk to you for advice etc. is it possible to call yomu or if you have time sir you may call us. you can see us at my face book account jennifer c. trinidad or here's my number 09175409738 0r landline 5028708. we really need to talk to you sir. i've been browsing you blog several times and really love it.thanks so much and God bless. its a month backpacking sir..what do you think is the best country to start our tour? hi ivan! How big is the budget that you alotted for this trip? Hi Ivan! If you dont mind me asking, how long did you stay in Europe and how much did you spend in your stay (just approx)? I and two other girl friends are planning to go there next year, and I just would like to have an idea how much we should allot for it. Yes, we are on a budget. Hi Ivan! What airline and route did you get from MNL to Paris? And may I know how much the range was for your airfare, one way?